The Lancer Tactical CA-305 Tactical Assault Plate Carrier Vest with cummerbund and accessories in Tan is a fully adjustable vest styled after assault type plate carriers. A fully adjustable set up that can be sized to fit small through medium sizes thanks to its adjustable shoulder and strap designs. 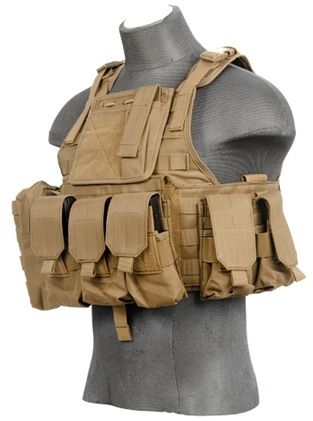 The shoulder straps incorporates both a adjustable slide and quick-release buckes for if you ever need them. The wais strap is adjustable as well to fit the user and the a removable cummerbund can be made to fit the wearer though its Velcro panel flaps. Featuring a 600 Denier polyester material built designed to last you in the heat of battle whether you're running, gunning, or under fire. Also features a mesh inner lining that is both breathable and comfortable to wear. 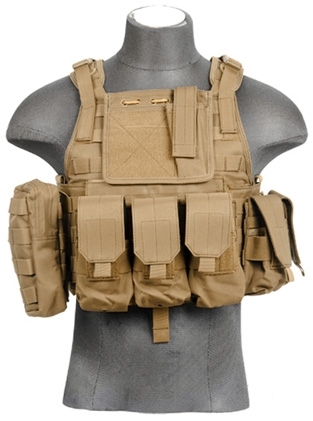 System of MOLLE panels can be found on the front, back, and the removable cummerbund to accommodate a variety of compatible pouches and accessories you may need in battle. The CA-305 series includes optional accessories such as a triple magazine pouch designed to hold M4/M16 magazines. The triple magazine pouch features 3 pouches with enough room to fit 2 magazines in each pocket to hold a total capacity of 6 magazines in total. A utility pouch for misc items with additional MOLLE webbing on its face panel. An Admin pouch with 2 Velcro panels for patches and identifiers as well as a small tactical pouch for small items like flashlights. 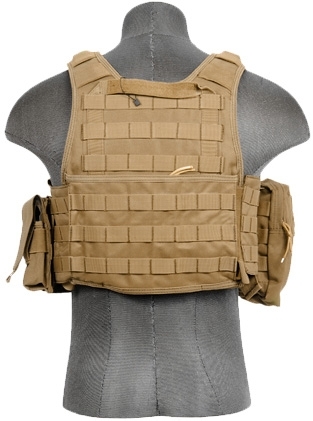 Plate compartments for ballistic plates (not included) can be found on the front and rear panels of the vest and can be accessed via Velcro flaps.